Elizabeth Cady Stanton's house in Seneca Falls, where the women's rights movement germinated nearly a century and a half ago. Imagine! Lizzie Stanton, radical thinker of the 19th century women's rights movement, painted her wide plank floors rich yellow, and-loving natural sunlight- put in a new window every time her abolitionist husband Henry embarked on a speaking tour. It's one of several cheerful stories told during a guided tour of Elizabeth Cady Stanton's house in Seneca Falls, the western New York town where the women's rights movement germinated nearly a century and a half ago. Not far from Stanton's home is Declaration Park, where the remains of the Wesleyan Methodist Chapel, host of the 1st Woman's Rights Convention in 1848, are carefully preserved. Most inspiring is the 140-foot wall on which the famed Declaration of Sentiments and names of its 100 signers, are engraved. Standing next to my young daughter, I was grateful for the handful of progressive women who refused to tolerate that- "[Man] has endeavored in every way that he could to destroy [woman's] confidence in her own powers, to lessen her self-respect, and to make her willing to lead a dependent and abject life." Next door, at the National Historic Park Visitors' Center, bronze statues representing early suffragists march across the floor. Upstairs, a maze of colorful, interactive exhibits and a 25-minute movie detail where women have-or have not-been, and where they are going-with increasing speed. It is at the National Women's Hall of Fame, however, that the soul and goal of women shine. Here the startling accomplishments of the famous, (Susan B. Anthony, Sojourner Truth, Amelia Earhart), and the not so famous (Virginia Apgar, Dr. Barbara McClintock, Sarah Winnemucca), are immortalized. By using telephones adjacent to exhibits, visitors can hear the words of these distinguished women. My favorite is Sojourner Truth's "Ain't I a Woman?" speech-her response to a man's statement that "woman can't have rights because Christ wasn't a woman." At the end of a biting retort, Truth concluded: "God and a woman made Christ. Man had nothin' to do with it." Women, bring your daughters-and your sons! Show them that the door to equality is open, but swinging. The next generations must be doers, not complainers. Read with them-and take to heart-the words of civil rights activist Fannie Lou Hamer: "I am sick and tired of being sick and tired." If you go: Seneca Falls. 15 minutes south of Interstate 90, Exit. 41. ·Women's Rights National Historical Park, 136 Fall St. Visitors Center open daily, 9-5 year-round, except Thanksgiving, Christmas and New Year's. Free. Interpretive talks and walking tours, June through September. 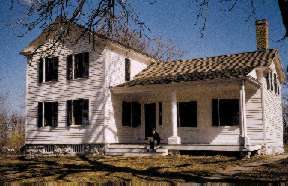 Daily guided tours of restored Elizabeth Cady Stanton house. Education programs available year-round; groups of every size. Bus tours welcome. 315-568-2991. ·National Women's Hall of Fame, 76 Fall St. Open May-Oct., daily, 9:30 a.m.-5 p.m.; Nov.-April, Wed.-Sat., 10 a.m.-4 p.m.; Sun., noon-4 p.m.. 315-568-8060. ·Seneca Falls Historical Society, 55 Cayuga St. 315-568-8412. ·Waterloo Memorial Day Museum, 35 E. Main St. 315-539-9611. ·Urban Cultural Park, 115 Fall St., 315-568-2703. According to WebCounter you are the person to seek the Best of the West!